The Highback Seat is made of durable vinyl and features double-stitched seams with double safety-locking zipper. Tested and approved for ages 2 years and older. 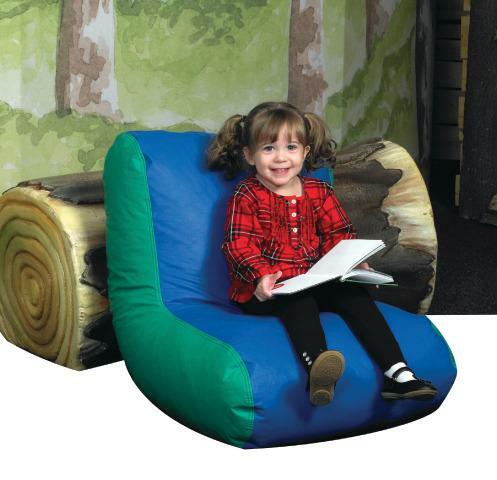 Perfect size for little ones to sit and relax. Please specify colors when ordering: Blue/Red or Blue/Green. CPSIA Compliant and Phthalate Free. THIS ITEM WILL DROP SHIP FROM THE MANUFACTURER AND TAKE 10-14 DAYS FOR DELIVERY. Dimensions: L: 26' x W: 21" x H: 24"